Recovery T-Shirts and Wearables | You Need a Meeting | Threads for recovering alcoholics and addicts! This quality T-shirt is available in either Black, White, or Ash (call regarding availability of other colors). 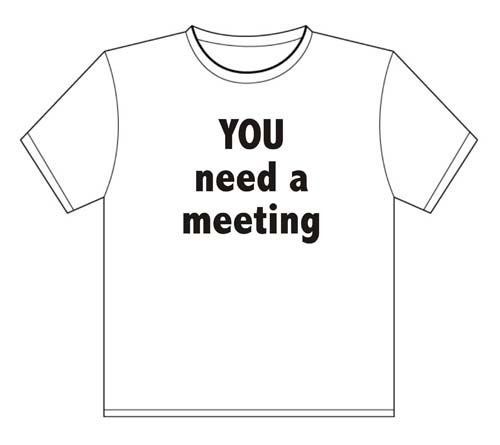 The front of the T-Shirt displays "YOU Need a Meeting!" Have an idea for a funny T-shirt? Need something specific for an event or special occasion? Please contact us! We can turn your idea into reality quickly and affordably!